Based on some lists I could easily convert, here's the giant game genie code list, https://gist.github.com/cracyc/8d29ec0a ... 1ac5206d3a. There are probably some errors but they should mostly work. Just put it in your mame cheat dir and enable the lua cheat plugin. Some of the other GG codes for elevator action in the cheat.simple file also fail. Made a one bit error, fixed now. Also added the ability to link cheats by replacing the description with a ^. 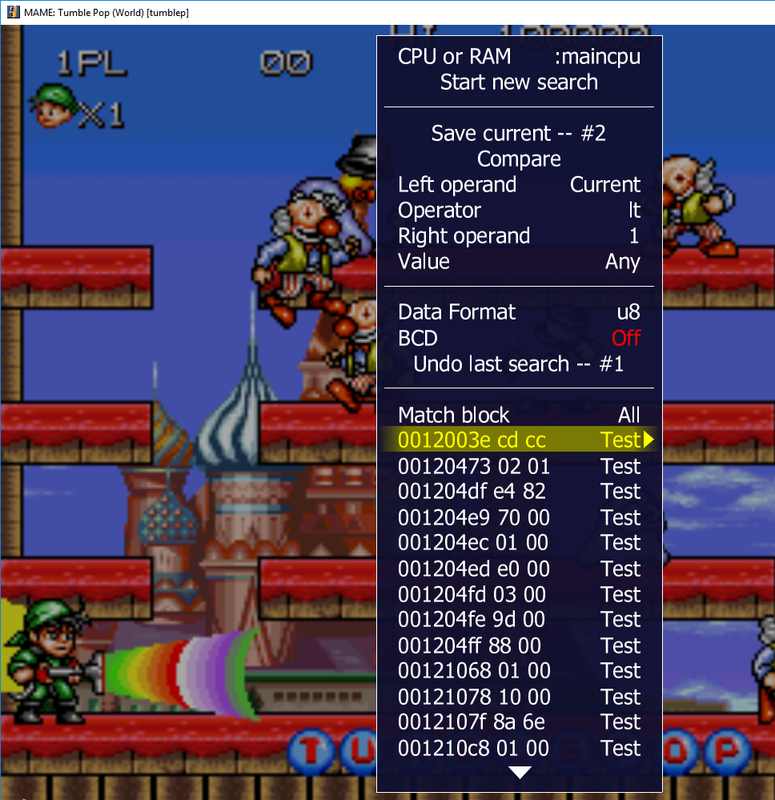 crazyc wrote: I've added support for cheat toggle keys. They can be set using the Set Hotkeys option from the plugin-cheat menu. The keys are saved in a json file in the cheat dir. The menu only allows setting a number plus a modifier for the hotkey but any combination can be added to the json file. I am using MameUI 64 0.187 and I don't see where to set the keys in the cheat menu option (when you pres TAB while the game is running) and the plugin options menu is empty. You can only press the "set" option as always in the cheat menu, but there is no option to assign a key like in the controls menu. Do you have to use the plugin options menu; and if so? Why is it empty for me? I can't believe that after so many years using MAME, I can now set the hotkeys for the cheats... It's like a dream come true. P.S. sorry for the double post, I'm not a spammer or anything, I just wasn't sure where tu post. The new cheat plugin is great, but is missing the ability to set the hotkeys to the controller buttons or stick. I hope that in the future MAME would let you assign any button, just like when you are setting the controller for the games. This is specially needed in games like Killer Instinct where an automatic combo breaker could be asigned to R3 for example, because you need it in the moment, no time to change to the keyboard to perform the two button combination. You can set it to a stick by editing the hotkey json file directly. JOYCODE_1_BUTTON1 is the first stick first button, I'll think about how to work that into the UI but it'll currently not be possible to set a key or button by pressing it like the input config. Added to the ui joystick hotkey binding. Now you can set hotkeys similarly to how the input menu works. It doesn't let you set multiple mappings for one cheat (which wouldn't make much sense IMO) [strike]and doesn't currently give feedback when polling except the game freezes for a second[/strike]. Added a popmessage when to press the hotkey to set. WOW That was crazy fast. I thought It won't be available that soon. Where can I download the new cheat.zip with this upgrade? There are changes to cheat/init.lua and luaengine.cpp so unless you can build mame yourself or get a recent build from someone you'll have to wait until the next release. Added very untested break/watchpoint support (in head right now but won't be part of .188 but .189 instead). If anyone actually uses it, be sure to let me know about problems. crazyc wrote: Added very untested break/watchpoint support (in head right now but won't be part of .188 but .189 instead). If anyone actually uses it, be sure to let me know about problems. The conditional and action would be part of the function parameter. Added input sequence cheats that sequenced button presses. 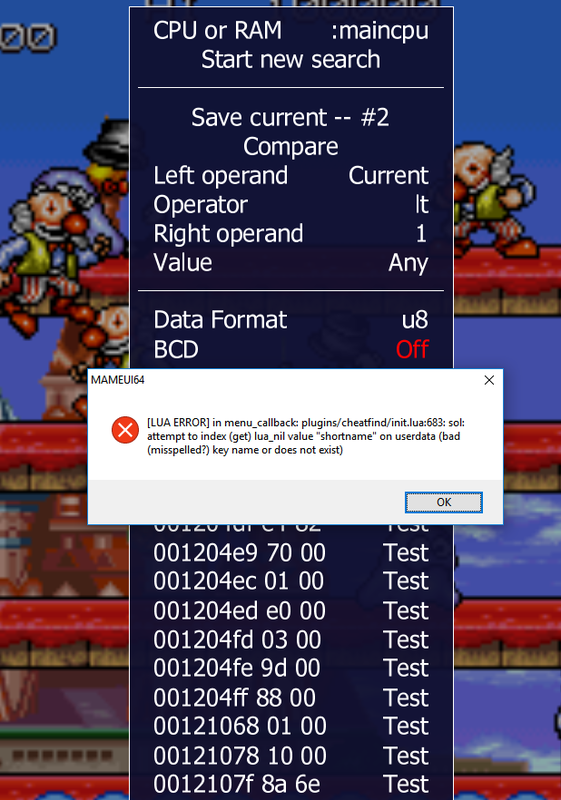 Limitations, only works from a key binding (not from menu), any button presses will work as normal so may interfere with the sequence and analog inputs can only be full off or on. Here's an example that does a Hadouken to the right in sf2. Start and stop are the frames after the start that the press should begin and end at. Hi boys... i have a setup whit mameui64 latest 0.190.... usually i like to find search manually and i can use the internal debug but today i know i can use this fantastic plugins... very great.... but i can't understand.. how it's works ? I have activated the cheat from game option and execute it.... from TAB i can see the Cheat and both plugins. I have start a game.. pause and make a new start. I have lose a life.... and now ?? How it's works the next search ? How i can know if my init.lua it's the latest ? I have tryed to read the Help inside mameui but i click on "Contets" inside "Help" tab and nothigs appends....... someone can help me ? When i select "TEST" "WRITE" or "WATCH" how i need to do... if i click enter i obtain an errors says "[LUA ERROR] in menu call back etc etc init.lua 683 etc etc keyname of not exist". How i need to do ? Every new value i need to save the ? And every next compare how i need to set on "Left Operand" ? The Default it's "Current".... how i can read a usefull documentation how it's works this newest cheatfind plugins ? I can use instead internal debuggers ? When you start a new search, the contents of the selected cpu ram or ram region are saved. Then you can compare the current or a selected past save (use save current to store another ram state) use the operators. The left and right operand numbers are a list of the states that have been saved and the operator is less then, greater than and so on (like state current < state 1 would show all the ram addresses where the current ram value is less than state 1 ram value). You can compare ram contents to a constant value (ltv,gtv, etc.) like say you know you have 2 lives left then compare current to value 2 with the equal to value operator (eqv) then all the possible addresses where lives might be stored (of course this won't always work but will most of the time) will be listed. If there are too many possibilities then you can lose a life then compare again with value 1. This will take the last list of addresses and show which of those are now 1 which should narrow the possibilities down significantly. If something goes wrong you can use undo last to cancel the last search and revert to the state before it and start new search will clear everything. Test will insert a cheat into the lua cheat engine which will set that address to the last value, write will write that cheat to disk and watch will display the contents of that address on the screen so you can monitor the value (they seem to be bugged in .190 though, I'll have to check that). Using mameui64 0.190... i start game i have two live. Put in pause... Open TAB.... Open CheatFind and make new search. Leave Pause and Lost a live... put in pause again right ? -Left Operatand "Current" -Operator "Lt" (left left than right, value it's different) -Right operand 1 (if it's correct this is the first search... it's the value use by compare right ?) -Value "Any"
I can't do anythigs.... it's a BUG in current supports ? Or wait... for mamedev gitgub i need to download all files from "cheat" and "cheatfind" or i can pick only the .lua files ?